If you're a member of GCSA only, please select this registration type. Please indicate if you're a registered member of both MoCDA and GCSA by selecting this registration type. If you're a member of MoCDA and not GCSA, please use this registration type. If you're interested in attending the MoCDA and GCSA conference as a non-MoCDA member, Please first fill out the MoCDA membership application, and then move forward with this registration type. Please Note the Added Session to the Conference Schedule and Updated Event Details in this Message. The garage is across the street on the opposite corner of the Busch Student Center. 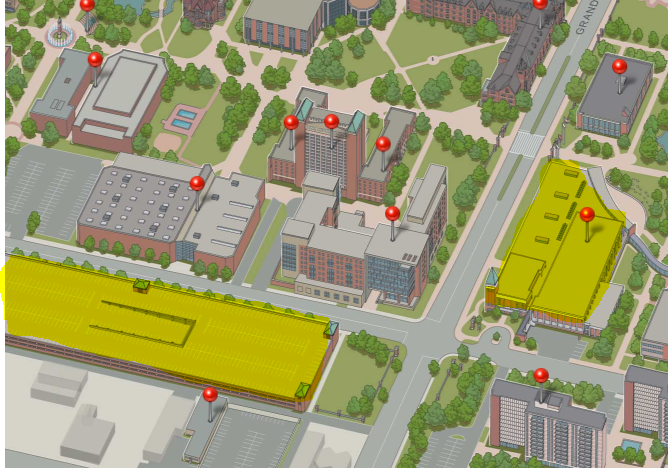 Highlighted buildings on the map show the parking garage (left) and Busch Student Center (right). The Missouri Career Development Association (MoCDA) and Gateway Career Services Association (GCSA) have teamed up to bring its members a joint 2018 Professional Development Conference. This partnership will give participants the opportunity to learn about unique programming and events that have successfully been executed across the career services landscape with limited financial and human resources. Our Keynote Speaker is made possible through a National Career Development Association Grant that the Missouri Career Development Association has been awarded twice consecutively. MoCDA and GCSA are excited to hear from Lakeisha Mathews and she incorporates the theme of Innovation & Creativity with limited resources through her extensive resume of experience. Presenter: Mako Miller, Career Development Coordinator, Kauffman Scholars, Inc. Session Description: Kauffman Scholars has a small career development department – a one-person department to be exact. With a limited budget and non-existent career development staff, how does the Kauffman Scholars career services manager oversee an internship program, develop a job, internship, volunteer, and education fair for 95 companies and organizations and over 600 students, create a shadow day event and round table discussions with local employers and build a Young Professional Institute, along with continuing to do resume reviews, interview prep sessions, job referrals, and professional dress workshops? The answer: PARTNERSHIPS! Through partner engagement with Kansas City companies and organizations Kauffman Scholars is able to develop programming for scholars and alumni of the program with a limited staff and budget. Learn how your career center can maximize partnerships to create career programming for your students. It takes a village (of partners that is)! Session Description: This session will give participants a glimpse into a major and career exploration introductory workshop for incoming first-year students at Fontbonne University. Session Description: In this one-hour session, participants will have the opportunity to join two conversations (30 minutes each). Topics include: Director Round table, Social Media Marketing and Communications, Employer Engagement, Learning Outcomes Assessment & first Destination Surveys, Working with Students in a Career Transition, Career Services in Professional Schools. Session Description: When finding their way to the future, a designer doesn't think it--they build their way forward incorporating curiosity and creativity. The design process can be applied in many ways, but what about career development and the services we provide to our clients? This session will provide an overview of the design process as outlined in the book Designing Your Life: How to Build a Well-lived, Joyful Life by Bill Burnett and Dave Evans of Stanford University. Examples will highlight how to apply this in career services programming as well as with individual clients. Breakfast: An assortment of fruit, danishes and breakfast bars, coffee and water will be served.